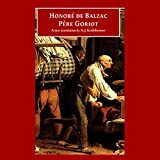 A classic realist novel set within the Bourboun Restoration, Honoré de Balzac’s most memorable story concentrates on the corruption of society, the sale of natural affection, the decadent debauchery of love, and the inherent doom of the selfless in a materialistic, social climbing world. In a word, this is essential Balzac at his finest. In a seedy boarding house in the Rue Neuve-Sainte-Geneviève the conniving rivalry between boarders sets a back drop against which we see the lower ends of society desperate to rise higher, whatever the cost. Here we meet our prime characters in this grimy little world which is painted with in-depth detail (hence the realist classification). We have Père (aka French for father) Goriot, a previously wealthy merchant laid low, some say by debt, others by prostitutes, but many say it’s by his heedless devotion to his two beautiful, status seeking daughters. Goriot is the figure of fun, the boarding house source of scorn, until the clever law student, one Eugène de Rastignac, takes an interest in the old man and his daughters. Rastignac comes from a family who are utterly devoted, depriving themselves of everything for his education, but Paris has told him to want more and a liaison with one of Goriot’s married daughters, to have such a woman as a mistress, will surely bring him into touch with the elegance of high life. Meanwhile, Vautrin, a criminal-in-hiding, espies a better money making scheme and seeks to teach Rastignac the real ways of the world, leading to a commentary on the shallowness of all those seeking materialism and a dour look on the world that is just as painful and depressing as it is sublime and unforgettable. I remember why I love Balzac so much, even though he continually showcases the ugliest, basest side of human nature in unerring, ironically transcendent prose. Le Père Goriot (also known as Old Goriot in some editions) was originally written in French, so of course there is the debate about editions, etc. etc. etc. I picked up the Recorded Books: Classic Library audio CDs at my library, translated by A.J. Krailsheimer and read by Paul Hecht. This particular edition does not provide any notes, context, or even an introduction on Balzac (such a prolific writer that he essentially died early of exhaustion). Some find this disconcerting. Personally, I was already aware of Balzac and his history from indulging myself in his novels since my early teenage years and was happy to just dive in. That being said, Balzac is not considered an easy read (easier than Shakespeare, harder than Dickens, I would say). Some readers may prefer to obtain a copy with notes and other helpful text to lead them through the tale. Balzac has a style of the debauched – Paris is filled with wives and their lovers, the husbands doing the same, meeting and on friendly terms with each wife’s temporary “true love.” It’s a world devoid of feeling and intent only on pleasure, attainment, social status, and above all wealth. Balzac presents this Parisian decadence and its appeal on the unwary in a style that transports readers into the world and firmly makes us see and believe everything. So quickly we know everyone and the secret desires of their hearts and we even suspect that we know just how far they will go. It’s not exactly a tale filled with sympathetic characters so much as a portrait of life devoid of humanity and consumed by the wordly. Balzac does like to make his point, and in case you didn’t get it, he’ll be sure to provide you with a tear-jerking finale that leaves you looking at the world through bleaker, jaded eyes. In this manner, it’s a difficult novel to read (and has even received some criticism for the sheer bitterness and representation of an entire literary world filled with selfish, uncaring persons.) Yet, let’s be honest, the ring of truth is what makes Balzac difficult to read. The manner in which he strips aside the veil and shows us all what we are capable of becoming combine with the eerie words of Vautrin who so plainly speaks and understands the workings of this world, proving himself, ironically, more of a gentlemen than the happily self-deluded surrounding him. Goriot himself and his stunning daughters are the true centerpiece of this gravestone for society, and the last images etched upon it are ones that will haunt readers. The manner in which his daughters interact and project themselves is captivating and off-putting, a train wreck we just must watch. The tale is actually fairly short and moves quickly. The action and pacing of modern works that we so adore is present within this story, moving us quickly through a spiraling world and mimicking the sucking vortex of society. Once you get pulled in it all speeds up, and soon you are hopelessly lost. Even the pace of the story echoes how quickly and easily found is the road to hell. Paul Hecht’s narration is a must for Père Goriot, especially for those of us who only remember a smattering of high-school French and would otherwise mercilessly butcher the pronunciation of the names. His enunciation brings the characters, situations, and conversations to life, fleshing out this world. 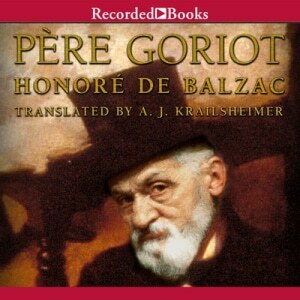 My favorite Balzac novel, Père Goriot is a must read. Highly recommended.